Few visitors explore this corner of Monet’s gardens at Giverny. It is hidden between his home and a row of linden trees. The pathway leads to nowhere: it used to be the way to Monet’s second studio, but the latter is not open to the public. 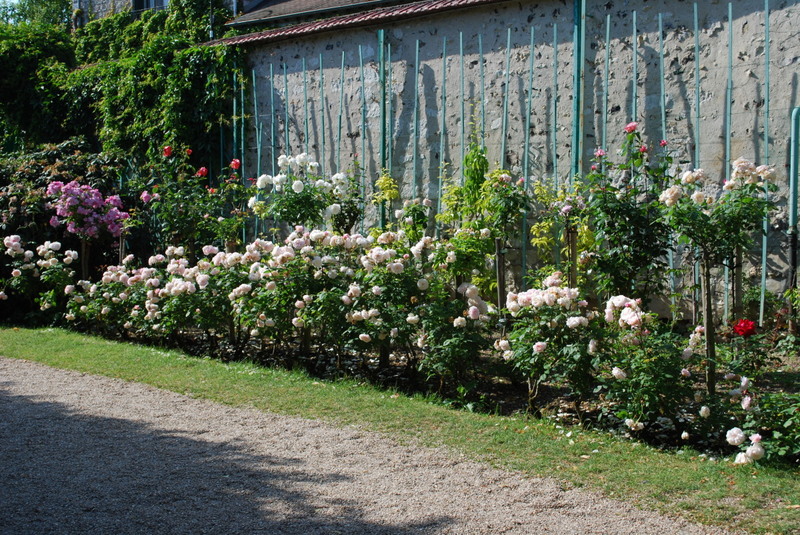 Monet had a small rose garden in this very protected area. A big wall shelters them from northern wind. Roses don’t get much sunshine either, but apparently they don’t mind. Many plants don’t dislike shadowed exposure as much as they dislike big changes in temperature. 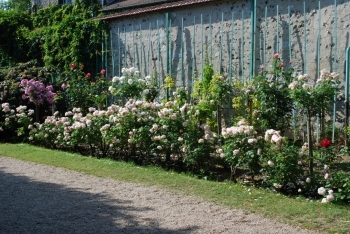 The roses planted in this pocket rose garden are at their peak at the turn of May and June. The picture was taken on June 4. If you visit Giverny at another season, you might want to look for this little corner not for the roses, but for the rhododendrons, the dramatic Philadelphus, or just for the shadowed bench offering views on Monet’s first studio.